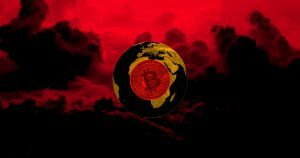 Forget about gas-powered cars and coal-burning factories for a minute, and think about this: Bitcoin mining alone could be enough to push the Earth into a state of climate catastrophe. That’s the takeaway from a report published Monday in the journal Nature Climate Change. But while it’s easy to read the headlines and think we need to address our bitcoin usage, that would be missing the forest for the trees. What we should take away from this report is that we are now at the point where just one activity has the potential to jeopardize our continued existence on Earth — and that means we need to change our ways. According to the University of Hawaii researchers behind the report, if bitcoin catches on at about the same rate as the average technology, the energy needed to mine it will increase global temperatures past the Paris Agreement’s 2 degrees Celsius (3.6 degrees Fahrenheit) limit by 2033. To reach that conclusion, they first determined where bitcoin miners are most likely to live and estimated the CO2 emissions their mining was likely to produce given their location. Based on that information, they determined that bitcoin mining produced an estimated 69 million metric tons of CO2 in 2017. The researchers then looked at everything from credit cards to dishwashers to figure out how quickly society typically adopts new technologies. Using that data, they projected that future emissions from bitcoin mining could tip the climate balance alone. Clearly, we need to take bitcoin mining into account when considering contributors to climate change. However, the figures presented in this report assume that we will continue to use fossil fuels and renewables in the same ratio we use them today. That simply can’t happen. Best case scenario: This report could put pressure on nations with the most bitcoin mining to speed up their transition to renewables. Worst case: We continue on our current path — toward climate catastrophe.